Days before she is sworn in to a second-six year term in the Senate, U.S. Sen. Elizabeth Warren took another step toward running for president in 2020. With an online video and a new campaign website, the Cambridge Democrat announced she is forming a presidential exploratory committee. In the video -- which discusses her upbringing in Oklahoma, her work to start the Consumer Financial Protection Bureau, and her 2012 Senate win over Republican Scott Brown -- Warren said her goal was to rebuild an American middle class that's now "under attack" by wealthy and powerful special interests aided by their allies in politics. "Working families today face a lot tougher path than my family did, and families of color face a path that is steeper and rockier, a path made even harder by the impact of generations of discrimination," she said. 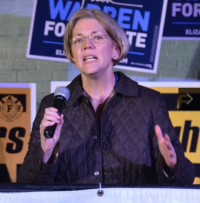 During her successful reelection campaign against Republican state Rep. Geoff Diehl of Whitman, Warren said she would take a "hard look" at running for president. A frequent critic of President Donald Trump and the first woman from Massachusetts to be elected to the U.S. Senate, Warren made official the persistent rumors that she was considering a presidential campaign at a late September town hall meeting in Holyoke, when she said it was "time for women to go to Washington and fix our broken government and that includes a woman at the top." Diehl, who gave up his House seat to run for Senate, was at the State House Monday cleaning out his office before the new session begins on Wednesday and Abington Republican Alyson Sullivan is sworn in to succeed him. "I wish her well," Diehl said of Warren, when asked about her exploratory committee. "I'm certainly not hoping she wins, but I wish her well along the way." During the campaign, Diehl repeatedly knocked Warren over what he described as her presidential ambitions, pointing to her national travels and saying she would be focused on efforts to attain higher office rather than the needs of Massachusetts. Warren took in just over 60 percent of the vote in November, besting Diehl and unenrolled candidate Shiva Ayyadurai. In her first run for elected office in 2012, she beat Brown with nearly 54 percent of the vote. Two polls conducted during the 2018 Senate campaign found a majority of Massachusetts voters did not think Warren should run for president. In a Suffolk University poll released in late October, 17 percent of respondents said Warren should run in 2020. In a MassINC poll that came out days later, 22 percent said she should. Massachusetts has a long history of presidential aspirants, including former Sens. Edward Kennedy (1980), Paul Tsongas (1992), and John Kerry (2004), former Govs. Michael Dukakis (1988) and Mitt Romney (2008 and 2012), and Green-Rainbow Party candidate Jill Stein (2012 and 2016). Earlier in December, former Gov. Deval Patrick decided against entering the 2020 fray. Warren raised eyebrows among political watchers over the weekend by dropping a reference to Massachusetts from her campaign Twitter handle, now @ewarren. "Every person in America should be able to work hard, play by the same set of rules, & take care of themselves & the people they love. That's what I'm fighting for, & that’s why I’m launching an exploratory committee for president," she tweeted Monday morning, along with the video and a link to elizabethwarren.com. The website asks visitors if they are "all in," "not sure yet" or "not in" for a Warren 2020 campaign. Potential supporters who select "not sure yet" are greeted by a page asking "What's holding you back?" with a window to enter their questions. Those who pick "not in" are asked to check a box indicating whether they're planning to vote for another Democrat, a Republican or a third party candidate or are still undecided, and to "tell us more about why you are out." The Progressive Change Campaign Committee, which ran a "Draft Elizabeth Warren for Senate" campaign in 2011, on Monday released a statement saying Warren "meets the moment" and, if she does ultimately run, would be "best equipped" to beat Trump, who has said he will seek a second term. "Elizabeth Warren is the most electable among many potential contenders with progressive positions, and it will be a victory for all progressives as candidates race to the top on issues we've worked for years to push into the mainstream," the group's co-founders, Stephanie Taylor and Adam Green, said. "In addition to being most electable, Elizabeth Warren is the only candidate who would enter the White House with an army of heavy-hitting allies accumulated over a lifetime of fighting powerful interests -- allies who are ready on Day One to use executive power to break up corporate monopolies, fight for equal rights and environmental justice, and restore sanity to our corrupt political and economic system."